Be a part of the Farm Bureau Agriculture Contact Team. Get updates on issues important to farmers and ranchers; respond to action alerts on pending legislation and regulation. Florida Farm Bureau advocates on behalf of farm families on the local, state and national levels. We represent farmers and the rural communities. By advocating for the programs and policies that help farmers and ranchers prosper, we help to protect domestic food production and Florida’s natural resources. Farmers and ranchers help to generate an annual statewide economic impact of $137 billion. They maintain greenspace, conserve water and preserve wildlife habitat. Our members are instrumental in helping us work together to accomplish our legislative goals that benefit all Floridians. To make a difference in your community, get involved by contacting your local county Farm Bureau. Advocacy is a powerful and necessary tool for the implementation of Farm Bureau policy. Our National Affairs Team works closely with our Florida Congressional delegation and the American Farm Bureau on federal legislative priorities that affect farmers and ranchers. For more information on national issues, please contact our National Affairs team at 352.374.1543. Our advocacy efforts are based on policy set forth by the actual farmers and ranchers of Florida who vote every year to adopt, reject, or change policies ranging from labor to environmental protection to the Farm Bill. Please reference the Florida Farm Bureau policy book and the American Farm Bureau policy book for our stances on hot topics of discussion. Our Farm Bureau Agriculture Contact Team (FBACT) grassroots program allows you to stay informed on issues that impact you. You will receive legislative, regulation and policy updates electronically. When important issues that require messages to our Congressional delegation or state legislators are needed, we’ll email you an Action Alert. The alert will include talking points and will automatically send your message to the correct person. Participate and sign up here. 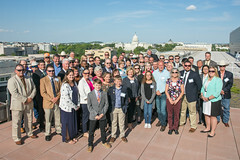 Farmers and ranchers from across Florida travel to Washington, D.C. each spring to meet with their elected and appointed federal officials and advocate for Farm Bureau policy priorities. Join us on the 2019 Field to the Hill Trip on May 14-16. The Friend of Farm Bureau award honors members of Congress for their dedication and commitment in support of agriculture and Farm Bureau policy. The award is given at the end of each Congressional session. Members are nominated by their respective state Farm Bureaus and approved by the American Farm Bureau Federation board of directors. Our Government & Community Affairs team is the link between our members and government officials and water management districts at the local level. Their goal is to ensure natural resource and land use laws and regulations address the interests of farmers and rural Floridians. Through grassroots involvement with county Farm Bureaus, the governmental affairs team relies on Farm Bureau policy set by our members to advocate for our farm families. For more information on local issues, please contact our Governmental Affairs team at 352.374.1543. Click here to view our report on “Waters of the U.S.” in Florida Farmland. Florida Farm Bureau members create our organization’s policies. Grassroots participation builds comprehensive, responsible approaches to issues of concern. Policy positions begin at our County Farm Bureaus, where ‘ideas’ become resolutions. Each proposal is discussed and considered in detail before a final decision is made at the Farm Bureau State Annual Meeting in October, when members representing each county Farm Bureau vote upon each resolution. Find out what goes into making your idea a resolution with the Policy Development Manual. The process of crafting policies to benefit members is a respected Farm Bureau tradition. That is why we consider the policies approved each year to be the fundamental guide for all of our activities. Florida Farm Bureau’s Advisory Committees play an important role in the policy development process. Committee members are experts in their commodity or area of expertise and keep Federation staff attuned to pending needs of the agricultural community. They advise the voting delegates on resolutions that may become policies, and help inform the state board of directors on specific issues.